On Saturday, June 22 tens of thousands marched in the Detroit Freedom Walk, which commemorated the 50th anniversary of the Detroit Walk to Freedom in 1963. The 1963 march was led by Martin Luther King, Jr and was the first time MLK presented his “I Have a Dream” speech. The 2013 march down Woodward Avenue stretched for blocks and included marchers of all ages from young children to veterans of the 1960s civil rights struggle. Contingents included faith communities, schools, unions, community organizations and many others. 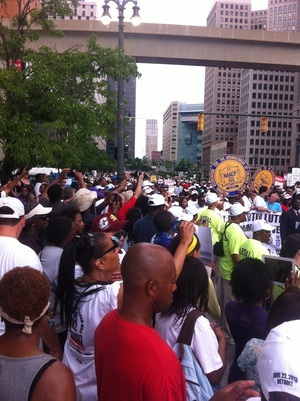 The march was co-sponsored by the Detroit Branch of the NAACP and the United Auto Workers and was led by Rev. Al Sharpton, Rev. Jesse Jackson and Martin Luther King III, among others. Far from a nostalgic stroll, the protesters were squarely focused on city’s economic devastation and the imposition of an emergency financial manager by Gov. Rich Snyder. Although Michigan voters rejected the state’s emergency manager law in November 2012, the legislature quickly passed another statute in early December. The appointment of Detroit EFM Kevyn Orr in March 2013 has been met by mass public protests and legal struggles challenging the constitutionality of the law, which allows the unelected manager to wield extraordinary power and to overrule the mayor and city council. In just a few short months, Orr has shredded union contracts, privatized city resources and services and has hinted he will take the city into the largest-ever municipal bankruptcy as a means to slash pensions and retiree health care. All this in a city with an unemployment rate that is more than twice the national average, a recent right-to-work law signed by Snyder despite mass protest and dozens of school closings in the past several years. Emergency managers in six Michigan cities oversee 9 percent of the total population but more than 50 percent of African Americans. In the face of this brutal assault, marchers came out to express outrage at the lack of democracy and call for a jobs program to revive the city’s economy. Sign after sign called for Orr to be removed and many called for the city to stop paying its debts to the big banks. Despite years of hardship, the marchers showed that MLK’s message of confronting racial and economic injustice is very much alive today. Austerity is being imposed on Detroit possibly more than anywhere else in the United States, but this march was a clear sign that the people are ready to fight.